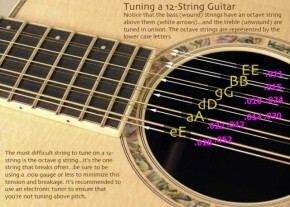 Bored with the guitar’s four-octave range (and that’s only if you have a 24-fret guitar)? You could succumb to the seven-string itch, but that will only increase your range by a perfect fourth (or five half steps). No wonder many guitarists lust for other instruments like the bass, six-string bass, 12-string guitar or—the horror—ukulele or mandolin. Thanks to the ElectroHarmonix Micro POG, you can expand the range of your guitar by two octaves without cheating on your faithful ax. The EHX Micro POG features two octave generators (sub/-1 octave and up/+1 octave) with individual blend controls (dry, sub octave, octave up) and separate dry and effect outputs that allow you to mix the three sound sources any way you please. 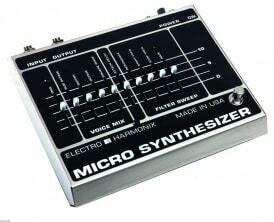 The pedal precisely tracks chords as well as single-note lines. The Sub Octave generator creates spot-on six-string bass tones (à la “Seven Nation Army”), while the Octave Up generator creates funky “sped up” guitar sounds (as in “Get Down Tonight”). Blend together Sub and Dry for “eight-string” bass, Up and Dry for 12-string guitar emulations, or dial in all three for fat, organ-like tones. 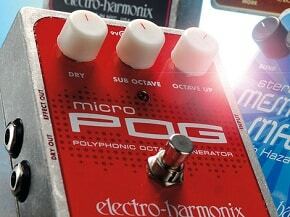 For less than you’d pay for a cheapo bass, the Micro POG turns your guitar into several new instruments. Thanks to GuitarWorld for the full report!